Welcome to the 3rd challenge presented by "Just Us Girls"! First of all, WOW! We are so excited that so many of you are playing along with Just Us Girls! Thank you so much for giving our challenge site such a sweet welcome! Are you ready for a color challenge?? Keep your creative mojo going with these three colors this week: aqua, red, and cream. As you can see in the graphic above, we've used color names from Papertrey Ink for reference. You do not, of course, need Papertrey Ink products to participate, these are just for reference. The "Hey There Cookie" DP is from the Cosmo Cricket Early Bird collection...I love this line! So what will you make? 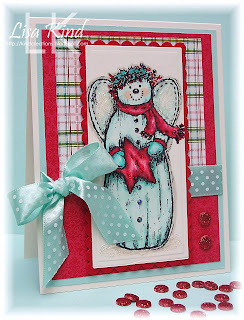 These colors can play happily with vintage themes, winter themes, etc. From graphic to shabby chic, the field is wide open. Let's play! How to play: You need to upload your project using this week's challenge to your online blog or public photo gallery. Leave a link that goes directly to your project in the Mr. Linky form at the end of this post. If you upload to online galleries, please also use the keyword or tag, JUGS3. After you post to Mr. Linky please leave a comment on this post. And now, "Just Us Girls" presents a little inspiration to get you started! Blog Candy: OK, so it's no $25 gift certificate BUT, I thought it would be fun to offer some blog candy this week that will be handmade just for YOU! The fabric flower on the card above was made by little 'ol me! I am loving this handmade flower technique and thought it would be fun to randomly chose a winner to receive an envelope full of these made out of various vintage fabrics. What do you think? Want some? Join in on the color challenge for a chance at some Paper Daydream Posies :) Make something, anything, with the colors aqua, red and cream and link us in the Mr Linky below. Have fun and good luck! Thanks for playing along with Just Us Girls! I might just play along for a chance to win some of those fabric flowers!! How cool are those? 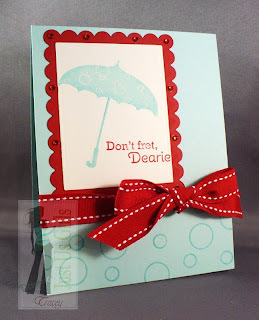 I made my card last week but the colors match, although the aqua was hard but used Sage Shadow. Thank you for the challenge. PS: I put your blinkie on my blog and will let my friends know as well. I am such a challenge junkie/groupie! What a great color combo - I can't wait to play! And, Dana, those flowers are FABULOUS! Oooh...we love and encourage challenge "junkies/groupies" to follow and promote JUGS :O) LOL Thanks!! Love those flowers, Dana!! What a great giveaway!! Love all the DT samples! Love the color challenge ladies! I MADE time to play today, it was fun. Great color combo! I am glad I had a chance to play again this week. Fabulous stuff ladies! Can't wait to see what everyone does with the challenge this week. Ooppps - I meant to tell you all that your sample cards are gorgeous!!! Love them!!! Great color combo! All your samples are amazing! Thanks for the inspiration! Had fun playing along again this week! I linked up my simple card with the colors. I love this blog and look forward to other challenges. Great job ladies. Just posted my card for a chance for those lovely flowers. Great cards in the samples. I here from Mona's site and I just wanted to comment that all of you have produced wonderful inspiration samples! These are ALL top notch! Love your site and these challenges should be fun! I just discovered your great challenge blog and had to play! Thanks for all the fun!! Girls - Another great challenge! Love these colors together! Yipee! Look at the packed house! What super DYNAMIC samples and terrific goodies! Sheesh! No wonder most of blogland is climbing over themselves to get in the game with you talented and amazing gals! 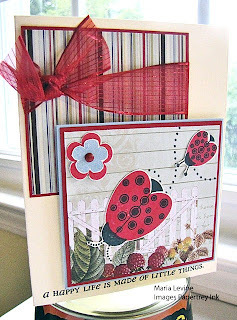 This is a ROCKIN' challenge - love those colors! Love 'EM! Thanks for sharing the fun! just found your blog, how fun! **Grinning ear to ear** You are all soooo wonderful! We are so happy you like our challenges and seem to be as excited as we are! We LOVE seeing your talented creations!! All of your projects are so inspirational :O) Thanks for supporting the JUGS! ROFL!!! Wow you guys are just 3 weeks old and already have a great following! Congratulations and thanks to Kristin and Mona for their inspiration! So excited to see all of your excitement here. I love that we have so many players here and JUGS and each one so creative and inspirational! Thank you girls for the lovely comments on my blog! I had never so many comments for one project! Thanks so much for the beautiful color inspiration! I am looking forward to the next challenge! I was so excited I did the challenge and then realized I should have used red, not raspberry. I think raspberry is part of the red family! I still enjoyed participating in the challenge. I am a Principal in a middle school and some of my students made me a blanket for Breast Cancer Awareness month. I made this card to thank them. I love the colours that you've chosen, and the flower is simply AWESOME! Beautiful cards ladies, those flowers are so cute! Hello Ladies! What fabulous flowers Dana! I finally got mine made and uploaded to SCS since I don't have time to write up a post for my blog...was thinking on this one a week nearly before I finally got a chance to put it together. I used Cool Caribbean since I don't have the Aqua Mist from PTI. Got to say again how much I love your challenge blog! It is growing by leaps and bounds and so happy for you all. Have a wonderful day!!!!! glad this is random pick - looked at some of these cards and they are awesome!!! You girls do such a great job making comments on each and every entry. Your thoughtfulness is very much appreciated! You are proving to be a very hospitable challenge blog, and I commend you!!! OH NO!! I didn't read all the details well enough. I assumed I had til Saturday since the Challenge was posted on saturday : (. Well I worked hard on the card, so I'm linking it anyway. I hope that's ok and I will work faster next time, hehe! Oooops it's my first time playing, and I did not read it carefully enough either I made my cards earlier this week but I could not link them until my post was up and I made my cards for the DT post I have to post on Friday's guess that means I am not elligible either?? ?